While we are all getting ready for Valentine’s Day, I don’t want you to forget about Chinese New Year. It falls on Valentine’s Day this year. Chinese New Year is a big deal in my family. My mom is from Taiwan. I was born in Taiwan. We still have all of my mom’s side of the family living in Taiwan. Also, my little Elle is turning 1 later this week. I decided to have a little Chinese birthday party for her this Friday with a few family members. We have several major events happening this year and I want to pace myself with all the party planning that I will do or help with this year. As part of the birthday meal, I will be making this simple fried rice dish. Cook rice according to box or rice cooker directions. Set aside. Scramble the eggs and cook over stove top, breaking apart the scrambled eggs while cooking. Set aside. Heat the oil in a wok on medium heat for a few minutes. Toss in the onions/scallions allowing it to cook for a few minutes. Toss in the chicken and frozen vegetables. Cook heating the vegetables thoroughly, frequently stirring. Once heated, toss in the cooked rice. Mixing it well with the vegetables all ready in the wok. Fold in the eggs. Break apart the bouillon cube with fingers and sprinkle over the all the ingredients cooking in the wok. Also salt and pepper to taste. Mix it well. Will you be celebrating Chinese New Year? 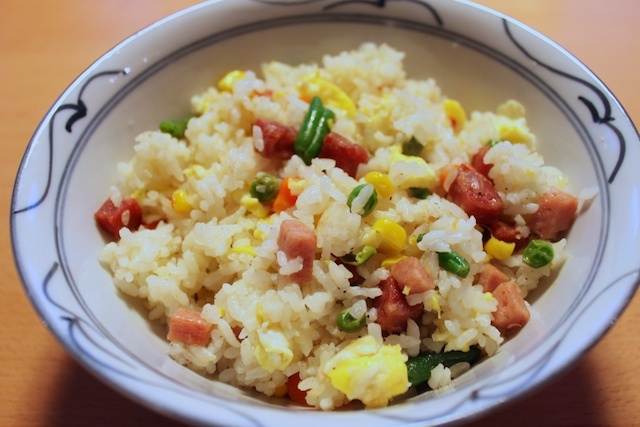 Oh thank you for this…I love fried rice and have been wanting to make my own for years! I will let you know how it goes! Your mom also puts sesame oil in it, which I love. I’m bummed that Chinese New Year is on Valentines. I like celebrating both…I’ll have to do a weird combo I guess.